Onboard Air India One, Jan 16: Prime Minister Dr. Manmohan Singh has said that both India and China are very concerned about the evolving situation in Pakistan and other countries in the neighbourhood. 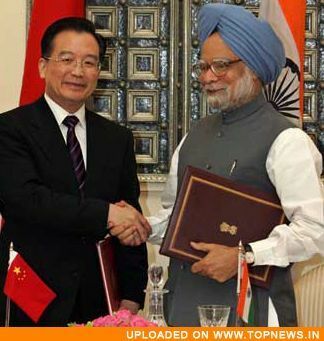 Addressing the media onboard Air India One, Dr. Singh said that during his first visit to China as Prime Minister, regional issues formed a significant component of his discussions with the Chinese leadership. "We had a very good discussion on what is happening in our neighbourhood, in Pakistan, in Iran, in Myanmar, and we both agreed that terrorism and fundamentalism constitute a threat. It is necessary for both our countries to consult each other on the evolving situation in our neighbourhood," Dr. Singh said. Reiterating that he had given his assessment of the situation in Pakistan, the Prime Minister said that the Chinese leadership was shocked by last month's assassination of former Pakistan premier Benazir Bhutto.